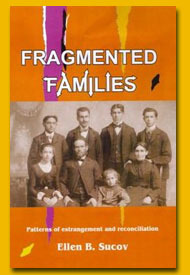 Fragmented Families has been chosen as the winner of the 2006 NATIONAL JEWISH BOOK AWARD in the category "Contemporary Jewish Life and Practice." The Jewish Book Council advised, "The book was selected out of many submissions after careful analysis by a panel of three judges who are all authorities in their field. It was chosen as the best written, most comprehensive and engaging book in its category. This book now joins the ranks of the hundreds of well-respected, classic Jewish books that have received a National Jewish Book Award." The awards were presented at the 56th Annual National Jewish Book Awards ceremony that was held on Tuesday, March 6th at 7:30 P.M. at the Center for Jewish History, 15 West 16th Street, New York City. Pearlstone Conference Center, Reisterstown, MD (Baltimore). 24 April, 2008.